The Macedonian Phalanx, a presentation of the famous military formation of the Macedonian Kingdom, introduced by Philip 2nd and improved by his son Alexander the Great. At first, the military comittment in the ancient Macedonian state was only temporary. First there were warriors and later there were high educated soldiers. As a soldiers could be taken every man above 18 years. Every spring there were a lot of military practices, tasks. In this period the Macedonian kings and the rich people had their own paid army. But everything is changing through the years and so and this. Philip 2nd of Macedonia (359-336 BC) changed all this. He introduced cavalry and catapults. They called it Macedonian Phalanx. It had 16 rows hard armed soldiers. All of them had 6 meters long copy called sarissa. The state took care for the weapons and the army clothes. 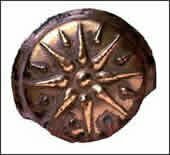 All soldiers had shields and on them the 16 pointed Macedonian sun. 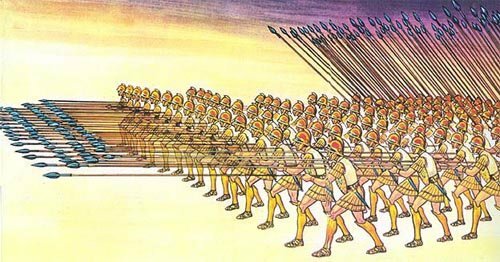 All the enemies have been afraid of the Macedonian Phalanx. Improved by the Alexander the Great it's been the best army in ancient period. Nobody ever wanted to fight with them because they knew that the would lose the battle. shield with the 16 pointed flag"
"The Ancient Macedonian Army - Phalanx"